Well that was a tough one! Tougher than I probably expected too. Today, I continued to dabble in the wonderful world of trail running with the Born2Run Minnowburn 10k. The Born2Run series is a succession of races around some of the most scenic locations in Northern Ireland, combining a bit on the road and a lot on the trail. As they say themselves, they are ‘great races in great places’. I have very limited experience of this type of terrain, only making my debut last month on a run around the Ulster Folk Museum, and then last week at Glenarrif Forest. The race today was the opening event in their 2017/18 series … and as well as a bit of road, and a lot of trail there was also a smattering of track. 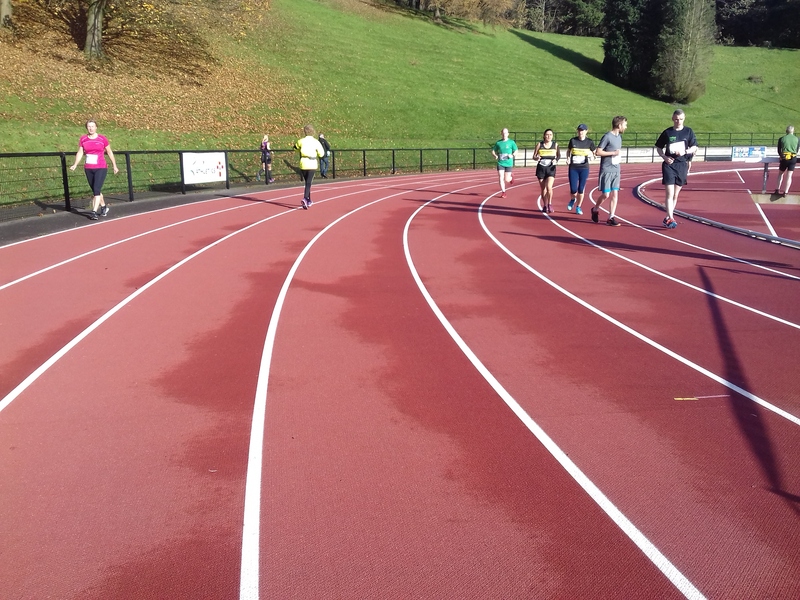 The event began on the world renowned Mary Peters Track (MPT) in Belfast, before diverting off into Minnowburn Forest and then finishing back on the track. I hadn’t run on MPT since my early teens when I very nearly actually won a race (I know, I know!). It was a churchy/youth club event with teams coming from all over the island of Ireland and I have distinct memories of leading the 800m by quite some distance for a lap and three-quarters before being eventually caught by a couple of 20-somethings who were much, much taller than me. I remember them saying to me afterwards that I really made them work for it but they were determined not to be beaten by a kid. I suppose there was a compliment in there somewhere … if only I had kept up running back then instead of ignoring it until I was old and overweight. But, anyway, I digress. So what about today? As I said we started on the track, doing a full lap and I suppose I got a little carried away with the excitement of it all, going off far, far too fast. I paid for it inside the opening kilometre because immediately upon leaving the track we were presented with a not inconsiderable climb, and then another one … and then and absolute brute of one (look at the elevation below, you’ll see what I mean). Thankfully there was an equally steep drop but that only gave me false hope because there was another every bit as challenging climb waiting just around the corner. I was knackered already and we were only a third of the way in. This wasn’t going to pretty, and, trust me, it got very ugly at times. Granted, the scenery was amazing in places. We were in Belfast, but we also weren’t. Unfortunately I wasn’t in the mood for taking pictures so there’s very little evidence but it was beautiful. I was just exhausted. My breathing felt laboured, my legs didn’t want to work, I got a bit of stitch … all lovely stuff. Thankfully, my head didn’t go. Well, almost. As we went through the last bit of forest (I actually wish I’d taken some pics of it, it was the best part of the run) before turning back onto the track the girl that was quite a bit behind me all the way suddenly passed me, and as she did I asked if anyone was behind her and she said there wasn’t. I’ve no idea where she summoned the energy from, although she was running with the tail runner so I presume he encouraged her. That meant I was actually going to be last! I wasn’t cut adrift by any means, there were a little group of us which I’d kept in touch with doing the usual game of cat and mouse, but on this particular occasion I was at the back which meant I was in the wooden spoon position overall. That wasn’t going to happen. It might not have been the gentlemanly thing to do (and I do feel bad about it now) but I made sure I went past her again and went as hard as I could manage until the finish. I was cross with myself for allowing this situation to even happen. Perhaps I switched off during the latter part of the race with my mind on another race tomorrow morning. Who knows? I’m not terribly bothered by my time or my performance. Trail running is a challenge, and it’s something I’m still very much a beginner at so I didn’t go into it with too much expectation. Anyway, it was a good experience on a number of levels and hasn’t put me off. It’ll also make me a stronger runner – or that’s the plan anyway! Tomorrow I have the Decathlon Series 10k in another part of Belfast. Thankfully this will be flat (I hope!) so it’ll be interesting to see how ‘easy’ I find it compared to today. Thanks for making the trip to the MPT for the first race in the series- I enjoyed reading your blog & hopefully we’ll see you at a few more of the races in the series. You did great on a tough course. Hi Carol, thanks for your message and for posting the link on Facebook, my viewing figures have gone through the roof!!! The timing isn’t great for me on a Saturday due to working in the afternoon so the next race I’ll definitely be at is Antrim because it’s the closest one, although I haven’t quite ruled out Drum Manor just yet. I actually found Minnowburn tougher than Cultra last month but I really enjoyed the challenge. The medals are pretty good too!